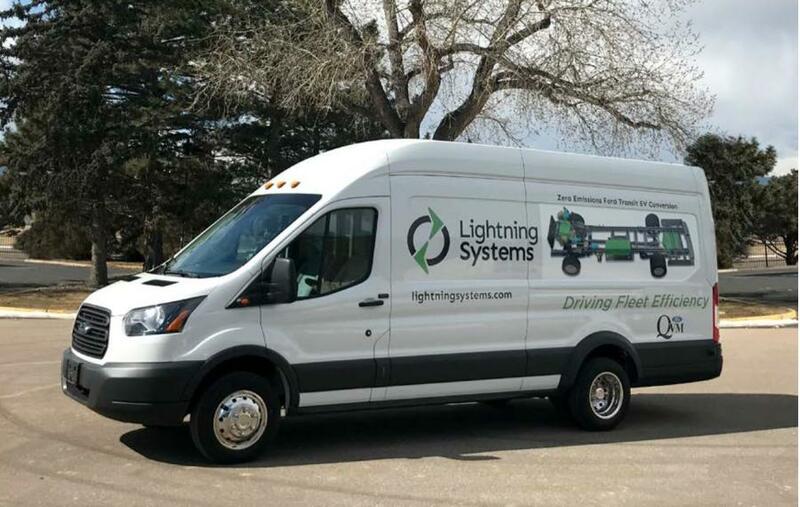 Lightning Systems, a global developer of efficiency and emissions improvement solutions for fleets, announced it is on schedule for March deliveries of its new zero-emissions LightningElectric system for Ford Transit and that it has developed a zero- emission hydrogen fuel cell range extender for the product. The LightningElectric battery conversion package available for Ford Transit as part of Ford Motor Company's eQVM program was announced last September. First customer deliveries will occur as planned. The new Lightning Systems zero-emissions hydrogen fuel cell range extender for the LightningElectric Ford Transit has been developed in partnership with several industry partners and will extend the range of the LE 50 to more than 200 miles. It will be available in California beginning in September 2018 where significant vouchers for fuel cell vehicles and infrastructure exist. “We're excited to deliver the LightningElectric zero-emissions Ford Transit as promised. Our road testing validated an industry-leading EV efficiency, and it is smooth, quiet, and fast,” said Tim Reeser, chief executive officer of Lightning Systems. Both the all-electric and the zero-emissions hydrogen fuel cell range extender are available for heavy-duty Transits with a 10,360-lb. gross vehicle weight rating (GVWR). Ford's vehicle warranty covers the base chassis for vehicles with the Lightning conversions. Installations and service are performed by Ford QVM upfitters and dealers around the world. The all-electric Lightning product features a liquid-cooled Lithium-Ion battery from a volume-ready world-class battery supplier that can be fast-charged in 30-minutes on DC fast charging, and in six hours with Level 2 charging. Depending on battery option and drive cycle, LightningElectric has a payload capacity of up to 4,000 lbs. The LightningElectric fuel cell range extender uses hydrogen stored onboard in high-tech carbon fiber-wrapped pressure vessels equipped with sensors. The hydrogen will be delivered to an industry-leading fuel cell to charge a Lithium-Ion battery with up to 30 kW of power. The vehicle will have a range more than 200 miles and top speed of 75 miles per hour, making it an ideal solution where long range and zero emissions are required. Lightning Systems, formerly known as Lightning Hybrids, is a fast-growing, global fleet solutions company with headquarters in Loveland, Colo. A variety of new Lightning Systems' efficiency and emissions improvement innovations are being introduced over the next two years to support commercial and government fleets. LightningAnalytics, a new cloud-based analytics system that provides drive, route and predictive vehicle health scoring for maximum range and efficiency, is available as an option with every Lightning Systems vehicle. The analytics system provides fleets with real-time information to operate their fleet at peak efficiency. LightningAnalytics also is available with the LightningElectric system, and is available as a standalone product with a variety of modules to provide efficiency solutions to fleets. For more information, visit www.lightningsystems.com. Looking for Construction Jobs? Construction Equipment Guide has you covered! Click here to see the latest listings in your area.